There's no doubt that the Toyota Sienna is the ultimate family car. Toyota has taken things to the next level. Introducing the all-new 2015 Toyota Sienna. 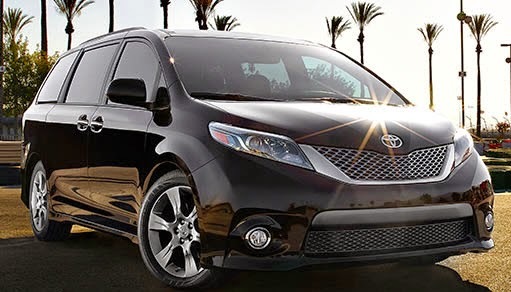 Boasting a 3.6 L, 266 hp, V-6 engine the Sienna has plenty of get up and go to keep up with your family. Despite its power it also offers efficiency. With an EPA estimated 25 miles per gallon highway depending on your family you may not have to make as many pit stops. The only minivan in America sold with available all-wheel drive, the Toyota sienna will help you stay in control no matter what conditions are on the road. The interior features of seating up to eight, dual power sliding doors, third row easy access, flexible seating arrangement capabilities, and entertainment features make the ride more enjoyable for the whole family. Toyota is committed to safety. Blind spot monitor, parking assist sonar, pre-collision system, and Star safety system which is a collection of six dynamic safety features stand ready to assist you at any moment to know only protect you from, but anticipate danger and work to help you avoid potentially hazardous driving situations. Put some swagger back in your life. Bring the family down to the Olympia Automall take a test drive in your brand-new Toyota Sienna today! Our expert staff and vast inventory will help you find what you're looking for. If you are searching for new or used cars in tacoma wa come to the Olympia Auto Mall. The Sienna is one of the few (the VERY few) SUVs that I would actually consider buying if I had a need for a vehicle that big.